I had to try this recipe written by Matt Moran in the latest MasterChef Australia magazine. It looked beautiful and the thought of tasting chocolate and ginger together intrigued me. This was the first time I made my own crust and I have to say, it wasn’t difficult. I will admit, however, that I need to work on my skills in this particular area! I should have rolled the dough a little bit thinner (don’t think I quite had it to 3mm thick), and I think I processed it too long in the food processor. I’m not sure though, I am not an expert on crusts (yet!). My crust was a little too crumbly on the sides (they broke when I tried to cut slices) and not crumbly enough on the bottom. The cocoa powder I used in the crust was Valrhona, which was also used to dust the top of the tart. Making the chocolate filling was quite easy as well. The recipe uses chocolate with a 70% cocoa content, but I wanted it to be darker still, so I replaced 50 grams of the full 250 grams of 70% chocolate with 85% chocolate. 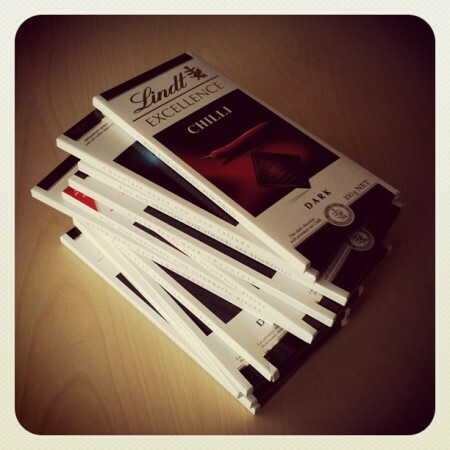 And I used my favorite chocolate – Lindt. This recipe takes 2.5 bars of Lindt chocolate, and as you can see from my Lindt stash, I have plenty to spare! 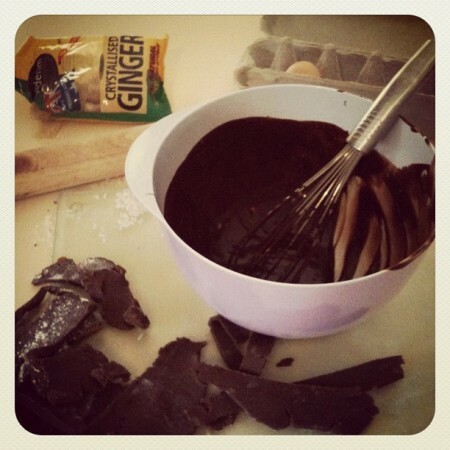 Crystallized ginger, eggs, my mixing bowl and favorite whisk, and scraps of chocolate crust! I was very impressed with the final result of this recipe. The tangy hotness of the ginger paired really well with the dark chocolate. The filling was perfectly baked – just set on top, yet still wobbly. This made for a delicious mousse-like center. It was just gorgeous. 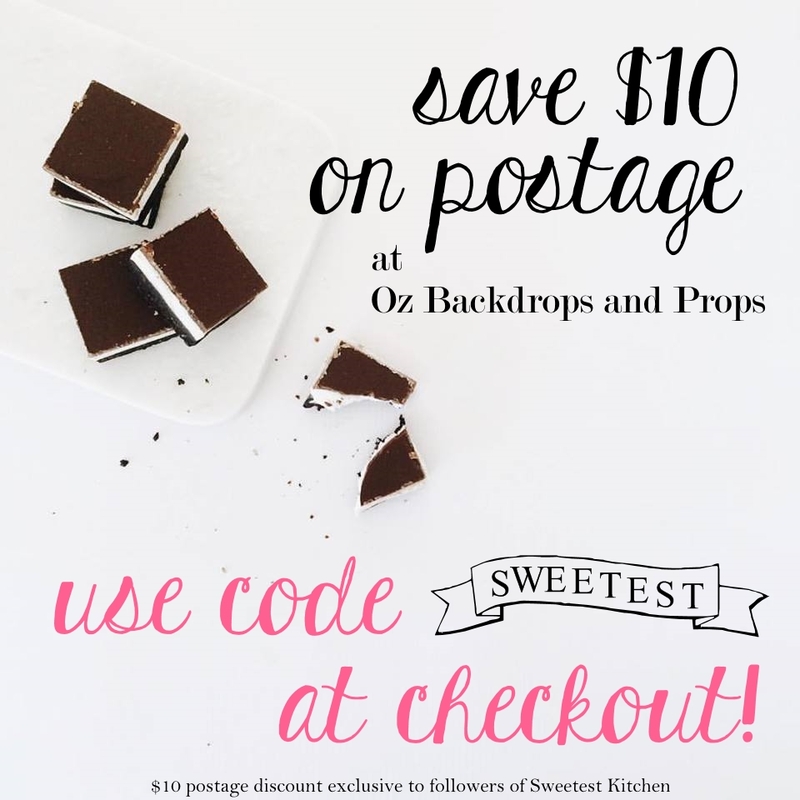 A delicious twist on the chocolate tart! Chocolate and ginger is one of my favorite flavor combinations and tastes wonderful in this tart from chef Matt Moran. For the pastry, process flour, ginger, cocoa and sugar in a food processor until combined. Add butter and process until mixture resembles coarse breadcrumbs. Add egg yolk and 2 tablespoons chilled water, then process until mixture just comes together. Shape into a flat rectangle, wrap in plastic wrap and refrigerate for 30 minutes. Remove pastry from refrigerator and leave for 5 minutes to soften slightly. Roll out pastry on a lightly floured surface until 3mm thick and use to line the pan. Trim edges, making sure to leave a 5mm overhang. Refrigerate for a further 30 minutes. Preheat oven to 180C. Prick base of pastry with a fork. Line tart shell with baking paper and rice, then place on an oven tray and bake for 10 minutes. Carefully remove paper and rice, then bake for a further 8 minutes or until pastry is dry. Meanwhile, to make the filling, place pouring cream in a saucepan over medium heat and bring almost to the boil. Remove from heat, add grated ginger and sugar, and whisk to combine. Leave to infuse for 10 minutes. Melt chocolate and butter together in a heatproof bowl over a pan of simmering water, being sure not to get any water in the mixture. Stir until melted and smooth. Remove bowl from heat and cool for 5 minutes. Strain infused cream into a large bowl, then whisk in eggs and egg yolks. Gradually pour chocolate mixture into the cream, whisking until combined. Scatter 100g crystallized ginger over base of tart shell, then pour over chocolate filling. Bake for 20 minutes or until surface is just set and the filling is still wobbly. Cool to room temperature, then refrigerate for 1 hour. 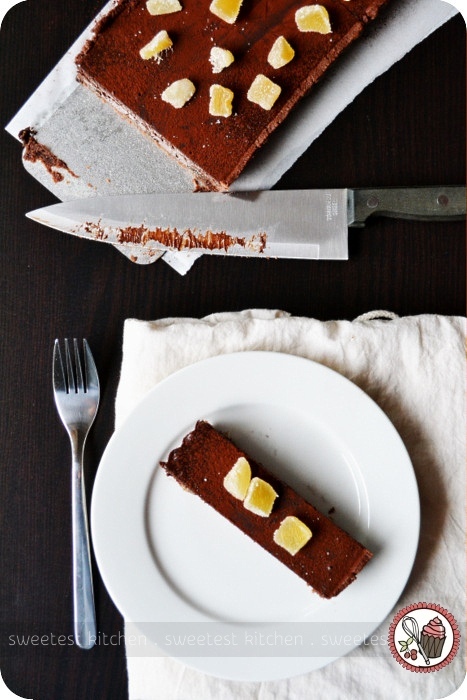 Dust tart with cocoa powder and scatter with remaining ginger. Serve with cream. This tart needs to be stored in the refrigerator. I cut mine into slices before placing in the 'fridge for storage. The filling will harden when chilled, but it can be warmed up again by a quick blast in the microwave - I did one slice for about 15 seconds on 50% power to return the center to its original mousse-like texture. If you do plan on storing this in the 'fridge, only add the crystallized ginger on top *just* before serving, otherwise, the ginger will sweat out a bit of liquid in the refrigerator, leaving an unattractive pool sitting around each piece of ginger! Chocolate and ginger sounds like a lovely combination! This tart is beautiful! I absolutely love chocolate and ginger together. This looks lovely. 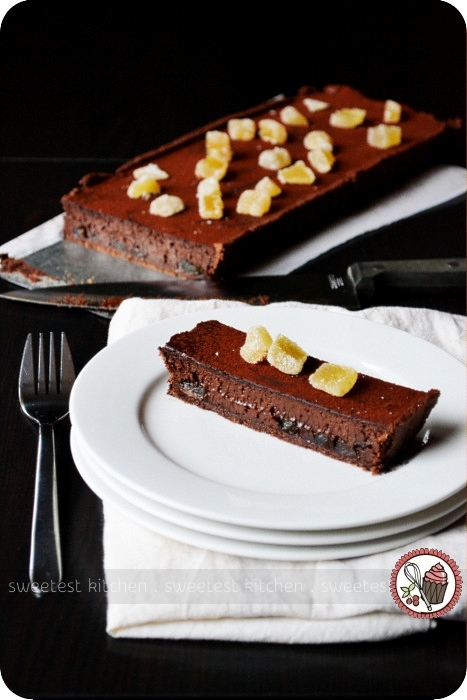 Chocolate and ginger is definitely a winner of a combo, and this looks so rich and oh…just gorgeous!